Length: 3 3/4” Weight: .9 oz. Length: 4 1/2” Weight: 1 oz. Years Produced: 1927–1963 (wood) and 1964-1978 (plastic). Length: 3 3/8” Weight: .6 oz. General Notes: A popular bait for collectors. Pikie color is the “sleeper” in this series. It wasn’t introduced until 1950. The Wigglefish series was also made in a tack eye variation. It was also reintroduced in the 1970s. A much later commemorative collector edition was produced decades after the company closed in Garrett, IN. Description of Pictured Lure: Dace is one of the better colors in this series, but not a rarity. This is one of the later glass eye lures with a single line tie and the ridged improved lip. General Notes: A very difficult bait to find in high grade due to its early & limited production. Part of the angler’s complaints stem from the metal tail instead of a hook, causing fishermen to lose fish. It was later replaced by a similar bait that solved this problem – The Wiggle Wizard. Description of Pictured Lure: #2504 in Golden Shiner. A smaller version of the #2400 series Wigglefish. Similar to other colors that were introduced early, this pattern evolved with different size scale patterns over the years of production. Locating the correct box for this lure can be just as challenging. General Notes: One of Creek Chub’s best sellers. Also seen in a multitude of special order colors. The earliest examples had "double line ties". Actually, the nose screw eye facilitated a quicker removal of the lip. Also, rarely seen with a "chin tie". 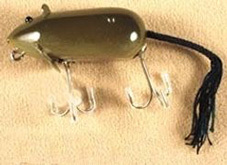 By 1961 tack eye lures replaced glass eyes. A Deep Diver lip was first offered as an option in 1950. Plastic lures were also teamed with wooden lures beginning in 1961. Description of Pictured Lure: #2600 Y in Yellow Pickerel finish. The rear section painted in bright yellow, the fore section in a gold glitter which was easily ruined once this bait was fished. This color & the Red Pickerel were produced only in the #2600 & #2700 series. General Notes: Made with the standard lips until 1950 when anglers could also order a Deep Diver lip. "Double line ties" are seen on early examples. Produced in fifteen catalog colors through 1960. Black or Frog colors are rare because they were produced for a limited time with glass eyes. Description of Pictured Lure: #2700 R in Red Pickerel. A dipped red rear section & a gold glitter fore section. Also made in a yellow finish with a glitter head. These seem to be scarcer than the same colors on the #2600 series. Offered 1933-1954. Length: 2” Weight: .6 oz. Length: 5 1/4” Weight: .9 oz. Length: 6 1/4” Weight: 2 oz. Length: 3 5/8” Weight: .7 oz. General Notes: Everyone loves this unique shaped design. Made in only three color patterns: #00 Bug, #02 Red & White, & #19 Frog. Sold as a “weedless“ lure with two rear single swing hooks. There are three different hardware modifications & size changes during the brief period this model was produced. It was eventually replaced by the #4800 Wee Dee series. Description of Pictured Lure: #2800, Bug Finish. The yellow body was dipped, the details were hand painted & airbrushed. This color had bead eyes, the other two employed glass eyes. A difficult bait to locate in super condition due to its limited & early production. The bulky body usually shows heavy age lines on the belly or worse. General Notes: A popular lure with collectors due to its scarcity & unusual shape. A slightly slimmer profile is observed on earlier examples. Made in only two catalog colors: #00 Natural Gar (a Pikie color twin) & #20 Green Gar. The two belly weights usually show age lines or paint cracking. The #00 Natural Gar color seems to be the scarcer of the two colors. Description of Pictured Lure: #2920, Green Gar. This color is unique to this series. The lure has “Gar Minnow” gold stenciled on its back. Although made until 1953, it’s an expensive & desirable lure, especially in excellent to mint condition. General Notes: The usual transition from a slimmer profile, unimproved lip, double line tie to a wider body, reinforced lip, single line tie, etc. Produced with glass eyes in fifteen catalog colors until 1960. A scarce example is #13 Black, produced from 1957-1960. This series was made until CCBCO sold in 1978. Wooden versions w/ tack eyes first offered c.1961. No wooden lures 1965-1966. Plastic baits were made from 1965-1978. Plastic and wood were offered together from 1967-1978. This & the #2300 Straight Husky Pikie have always been among the best sellers for CCBCO of any of their large size lures. Description of Pictured Lure: #3033, Black Scale. Produced only from 1952-1956 with glass eyes. It has all the late features including “Creek Chub Pikie” gold imprinted on its back. This color was standard made on 23 different series. General Notes: This bait has a red hollow mouth & a steel leader with a metal spinner attached. The lure should have this leader to be considered complete. Similar to other pre-war baits, tough to find in minty condition. Description of Pictured Lure: #3100, Pikie. Employs the earlier Pikie paint pattern from the pre-war era. Usual bronzed hooks on this color lure. Sometimes accompanied by a factory hang tag instructing angler in the nuances of fishing this lure. Length: 3” Weight: .5 oz. Length: 4 1/4” Weight: .7 oz. Length: 4 7/8” Weight: 1.4 oz. Length: 4 7/8” Weight: 1.6 oz. General Notes: A surface lure that was one of CCBCo’s top sellers. Produced in fifteen catalog colors throughout the glass eyes period (thru 1960). The early models have a “humpback” profile as do the Shur-Strike baits made by Creek Chub. A study of the color patterns in the two lines of baits is necessary to tell the difference. The company started making tack eye baits in 1961. No wooden Plunkers during 1965-1966, then reissued from 1967-1978. Plastic lures were added to the line from 1965-1978. Description of Pictured Lure: #3208 in Rainbow. One of the most beautiful colors from this company. Rainbow was offered on Plunkers from 1928-1956. Early examples have a silver back, later versions generally have a blue back. General Notes: A scarce bait due to its short production span. Similar in appearance to the very successful Heddon Zara Spook, except the CCBCo bait is in wood instead of plastic. #02 Red Head & White or #18 Silver Flash seem to be the colors most often seen . There is also a non-catalog variation with SIDE hooks instead of a belly hook. Description of Pictured Lure: #3318, Silver Flash. 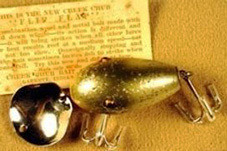 Pre-war lures in Silver Flash often exhibit a gold-hued glitter instead of the usual silver glitter seen on later baits. A top water bait that requires a lot of rod action to make it work properly. General Notes: This lure had many name changes, but is generally known as the Snook Pikie. It employed the usual transition from the early features to the updated lip, single line tie, etc. Offered with glass eyes through 1960, then sold with tack eyes until the company closed. Not made in plastic. #3435, Purple Eel. This color is sought after by most collectors & was offered on fourteen different series. This one is gold imprinted on the back “Creek Chub Pikie.” #35 color was produced with glass eyes from 1953-1960 and with tack eyes in 1961 on the Snook Pikie. General Notes: This big old surface bait is difficult to find in superior condition. The earliest examples had screw eye hardware. The sheer mass of the large baits often caused above average damage to the surfaces. Evidently there was a limited demand for this lure because not many appear in ANY condition. This bait made until 1961, so most were produced with glass eyes. The weight was reduced to 1 1/4 oz In 1957. Not made in plastic. Description of Pictured Lure: #3505, Dace. The spinners are the standard size but the three treble hooks are “muskie” size. A top water bait that was fished in a manner to fool the fish into striking a dying minnow. Length: 2 5/8” Weight: .7 oz. Length: 2 5/8” Weight: .6 oz. Length: 2 1/2” Weight: .8 oz. Length: 4 3/8” Weight: .7 oz. General Notes: An intriguing design produced in only three colors. The #00 color is Gray. Some lures were made during WW II and featured plastic ears & lip instead of metal. The braided tail was held in place with a wooden plug. Bead eyes are standard. One lead belly weight. Not marked; painted in either gray or white or black, so beware of repaints. The paint is usually chipped around the lip or ears, even on superior examples. Other CCBCo mouse designs were introduced in the 1950’s. Description of Pictured Lure: #3600 in Natural Gray. Uses an unusual flat lip that is also shared with the #3700 series River Rustler. Fished in a manner to resemble a frantic mouse trying to escape the water. One lead weight in the belly. General Notes: Offered in six colors. An underrated lure offered for only five years. Especially difficult to acquire with virtually all the paint on the lip. This flat lip was also used on the #3600 series Lucky Mouse. No other Creek Chub lure shared this body design. Description of Pictured Lure: #3704, Golden Shiner. A color often missing in many River Rustler collections. Purchased at the annual Garrett, IN Creek Chub auction. Consigned by an ex CCBCO employee. General Notes: All Beetle catalog colors were designed for this & the Midget Beetle series only. Earlier examples have unimproved lips & sometimes no model markings. Soon thereafter, “Beetle” was stenciled on the back. Later, the name was gold imprinted on the belly. There are many slight differences with details within each color depending on the individual painter. Also, there are variances of base colors. The #51 Green Beetle will range from a gold/green body coat to a medium metallic green. There was a small group of Beetles sold outside of the catalog in the 1960s and possibly 1970s. A quantity of black or white primered Beetles were found after the factory closed. Beware of exotic repaints or those sold as black or white “specials”. #3851, Green Beetle. Has a solid painted body with contrasting wings, hand painted borders & airbrushed spots. The mother of pearl spinners were imported. This is an early specimen with an unimproved lip & no marking on the body. General Notes: One of the most coveted Creek Chub designs. It uses a corrugated lip employed only on this bait. Painted in two motifs: #00 Y - Yellow Sucker, #00 B - Black Sucker. The latter is the rarer color. Suckers turn up surprisingly often for such a limited production bait, but are usually found in rough condition. “Has a natural slow rolling wiggle just like a real sucker” is a quote from an early catalog. #3900 Y, Yellow Sucker. Painted in a golden/green scale pattern. Two screws hold the lip in place. No other Creek Chub lure shares this body profile. I believe this lure was made for less than two years. General Notes: A patented lure. Early examples use a special crimped edge lip for more strength. Top screws held the belly hook. A side screw for the tail hook. In the late 1930’s through–wire rigging & an improved lip replaced the earlier hardware. Huge single hooks or trebles were optional & were so coded on the box. The treble hook examples are worth about half the value of a lure with single hooks. Most have glass eyes. A stout bait for big fish. 4002, Red & White. Two giant single hooks which are considered more desirable than a variation with treble hooks. An improved lip, through-wire rigging and glass eyes. Most examples observed are heavily marred. #4111, Luminous White Head & Black. Referred to in early catalogs as “Black Body with Nite-Glow Head”. The scarcest color scheme on this series. The white head is actually a cream color. General Notes: Overall, this bait is more difficult to find than the straight #2200 Midget Pikie series because it wasn't introduced until a decade after the straight version. One of the toughest colors is #19 Frog. It was produced for just two years (1959-1960). This series is one of the Creek Chub company’s many patented baits. Not made in plastic. #4202, Red Head & White. This design was a sinking, wiggling lure. It is a later example with “Pikie” gold imprinted on the head. General Notes: Resembles a Baby Pikie but it isn’t. It has a belly weight in front of the belly hook, a large scallop on top of the head & it‘s 1/2“ shorter. The River Scamp is one of seven series offered (as an option) with a Deep Diver lip starting in 1950. Scamps were originally for sale at 90c in the 1930’s. The #00 color was Chub, a color offered on only five bait casting series. #4305 DD, Dace. Notice the extended Deep Diver lip. Also, the BLUE area between the sides & back of the body. This defines this color from the New Red Side pattern. Length: 2 3/4” Weight: .6 oz. Length: 2 1/2” Weight: .7 oz. Description of Pictured Lure: #4418, Silver Flash. One collector aptly dubbed this a Platinum finish. It has a metallic gray airbrushed on the face & back instead of the usual olive green head & silver chain pattern seen on most #18s. Another one-of-a-kind CCBCO design. General Notes: A seldom offered bait, especially in superior condition. This lure replaced the Baby Wigglefish in 1934. Instead of a metal tail, the Wiggle Wizard replaced it with a treble hook. CCBCO had this to say about the new jointed bait “You’ll be surprised at the results this little lure will give”. Produced in six colors. Description of Pictured Lure: #4501, Perch. A small jointed bait that evidently never caught on because examples today are scarce in ANY color, especially in prime condition. This design was introduced & met its demise within a few years. Perhaps similar action baits such as the smaller Jointed Pikies contributed to the decision to drop this pattern. General Notes: Offered from 1936-1945, not available from 1946-1949 then reintroduced in 1950-1951. Therefore, actually made for a total of twelve years. Some CCBCo documents mention this lure with a standard black and white paint while others mention a black bait with a luminous white head. Oddly, the 1950 and 1951 CCBCo catalogs list #11 as black and red! This is probably a typo. Another rare one is the #13 Black. The Skipper has a weighted tail causing it to stand almost vertical on top of the water. A surface bait offered at $1.15 in 1951. #4601, Perch. A concave face to create a surface fuss when worked in short “twitches” by the rod. Has two treble hooks. Not a rare color, yet still scarcer than most common Pikies and Plunkers. General Notes: Illustrated in the catalog, but not available from 1947-1949. This weedless surface bait replaced the #2800 series Weed Bug. It utilized three single swing hooks pointed up to avoid snagging. Also, one lead belly weight, a steel leader & two steel weed guards. Made in only three colors. This bait appears to be even scarcer than its predecessor, the Weed Bug. Priced at $1.10 in 1942 catalog. A much later & different version was made in plastic while using this name, but actually resembled the Weed Bug. #4819, Frog. Has a steel leader, 3 swing hooks to make it weedless, & a belly weight. Length: 4 1/4” Weight: .6 oz. Length: 3 1/4” Weight: 1 oz. Length: 2” Weight: .7 oz. Length: 1 5/8” Weight: .4 oz. General Notes: A cousin to the #2000 series straight Darter. The #4900 series was not available from 1965-1969. The later post-1960 baits are often difficult to tell from the earlier examples. One clue is the foil label on the lure's back (which is often missing). Some early Darters are unmarked, followed by those with a stenciled name,then a gold imprint on it's back. #4931, Rainbow Fire. This & the #32 Fire Plug are very delicate finishes. The paint often “ripples”, perhaps from too much heat. The surface should have a “peach fuzz” appearance. If it has a sheen it is usually polished. CCBCO DID make these colors after 1954 with a bright varnished finish in thesepatterns. A comparison of varnished & buffed baits will show the differences. Those with varnished #31 & #32 colors are much scarcer. Often, the original #31 or #32 Gantron baits will have a small yellow paint tag on the hook. These baits glow under a UV black light. General Notes: Made in one combination of colors only. Sometimes seen with the upper tail fin in red but pictured in the catalog with this section in golden-yellow. Usually offered with gold plated hooks & screw eyes, but again, there are exceptions. Has a long lead weight in the upper fore section. It is near the surface so it is usually broken through the wood & paint. Listed at 1 1/2 oz. but I weighed it at 1 oz. Produced for the “demand of the salt water fisherman” as stated in an early catalog. This lure is on virtually all CCBCO collector’s “want list”. #5000, Close-Pin. This example has all bright metal hardware except screw eye in tail, which is gold plated. Most #5000's, but not all, have all gold plated hardware including hooks. This lure is usually found in well-used condition, attesting to its fish-getting ability. General Notes: The measurement doesn’t include the tail. The first of the popular “hair” (horsehair) baits. Each lure color has color-coordinating dyed hair tails. Usually observed with a wire leader. Early examples had unimproved lips & either no body marking or “Dingbat” stenciled on its back. Later versions have the improved lip & the model gold imprinted on the belly. Made in the same seven colors throughout production. This series was the best seller of the hair baits. #5100, Pikie Scale. Improved reinforced lip, “Dingbat” on belly, bronzed hooks. Dyed brown horsehair tails, original steel leader. An instruction card sometimes came with a boxed lure showing the angler the correct way to fish this bait. General Notes: A miniature of the #5100 series. It has a smaller lip, hooks, & body. A good seller for the company. Made in the same colors as the Dingbat: #''s 00, 01, 02, 04, 13, 18, 19. Each color had coordinating dyed horsehair tails. Also, known as the “Baby Dingbat” in reference books, but listed in the old catalogs as a "Midget", & "Ding Bat" in two words. #5202, Red Head & White. The same style hardware as the larger version of this bait except on a smaller scale. No model name on this example. The usual company marking on the metal lip. Length: 5 1/4” Weight: 1.4 oz. Length: 2 1/4” Weight: .5 oz. General Notes: A very scarce bait in any color, especially in prime condition. The scarcity is based on two factors: A limited production during the war years & less demand from its intended market – the Pike or Muskie angler. Typically, baits made for bass far outsell “Muskie size” examples. A big brother to the #5100 Dingbat (sometimes listed Ding Bat) & #5200 Midget Dingbat. Has through-wire rigging, glass eyes, and dyed horsehair tails matching the paint scheme. #5300, Pikie Scale. This big boy is seldom seen above VG condition in ANY color. "Dingbat" is gold stenciled on its back. Finding the correct box can also be a difficult chore. General Notes: One of the nine series chosen to use #24 Redwing Blackbird & #25 White Scale finishes. This bait is scarcer, overall, than the #5100 Dingbat or the #5200 Midget Dingbat. It’s a surface bait with a concave mouth to create a top water commotion. They typically have no body marking or sometimes “Dingbat” is gold stenciled on its back. Employs two double hooks. #5419, Frog. 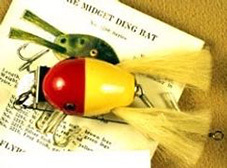 This hair bait has matching green dyed horsehair tails, “Dingbat“ gold stenciled on its back, and a lead belly weight to make the bait sit at an angle on the water. General Notes: This bait had glass eyes through 1960, then tack eyes. Production was then abandoned from 1965-1968, but a clamor from anglers forced the company into a resurrection of this lure, although in a more limited color selection. This is a larger version of the #2600 Jointed Pikie series. The #5500s have through-wire construction, large hooks & an improved lip. A CCBCo catalog denotes it’s specifically made for “Pike, Muskies, Lake Trout...and salt water fish”. No plastic baits in this size. #5507, Mullet. Two top screws hold a reinforced lip in place. “Creek Chub Pikie” gold imprinted on top. This color is available in many hues from silver to this “Mediterranean” blue. Sometimes this is a result of fading, but mint lures are found in all hues. Therefore, I believe many were produced in these variances of Mullet color. General Notes: 4” long with its hair tail. Similar to other hair baits, the horsehair tail is dyed to match the bait color. All Dingers have a marked lip. A nickel plated head plate is marked “Dinger”. Later, a brass head plate was substituted, perhaps during WW II when there was a shortage of nickel (a metal so important that it was even deleted from U.S. 5c coins). Finally, the head plate was eliminated. Some earlier examples have the model on the plate & “Dinger” stenciled on the lure’s back. An early catalog had this to say “Proves itself irresistible to all types of game fish“. #5618, Silver Flash. A later type without a metal head plate & no body model marking. Has the usual lip with company & patent markings. The hair tail is red & white, matching the color scheme of the lure. The rear hook is held by an unusual dogleg external bracket tacked into the belly. The other end fits into a screw eye that in turn fits into the tail slot. A metal leader seems to be standard.